We’re coming to the end of the series “The Secret to Make Him Chase You” – I’ve gone in-depth on the things that are MOST important for you. 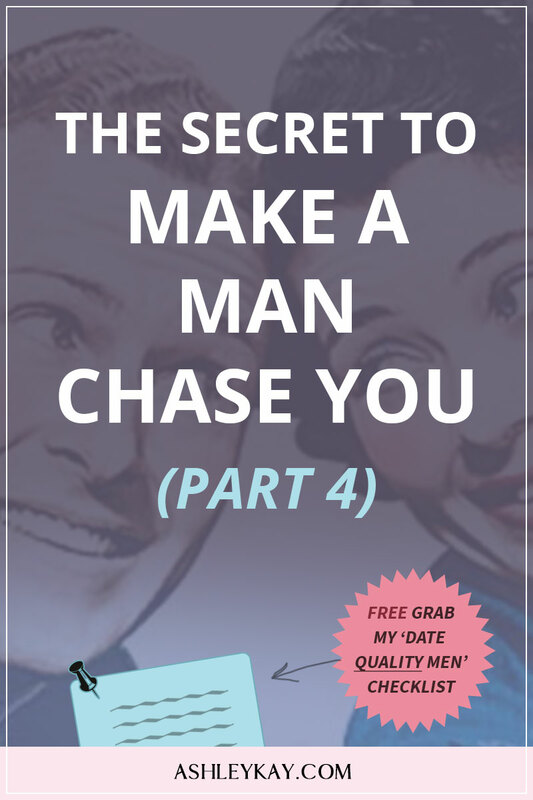 Part 1 – Make Him Chase You: The Fundamentals – The fundamental mindset you need to get a man to chase you. Part 2 – Make Him Chase You: Irresistible Confidence – How to have that “irresistible confidence” that naturally attracts quality men to you. Part 3 – Make Him Chase You: Male Psychological Triggers & Tactics – The male psychological triggers and tactics to use that will unlock his irrational illogical side to chase you. 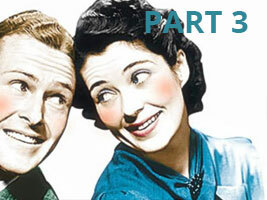 This last instalment is about what NOT to do if you want a man to chase you. A lot of what we’ve talked about is how to “pull” a man towards you effortlessly. But you also want to ensure your efforts will not be in vain. As you become more attached to a particular man, your actions and thinking will change. Basically when feelings get into the mix, stakes also get raised. Now you have something to lose. This will naturally create a level of stress and anxiety. Now everything has a double meaning. When he messages you, it matters when and how often. It matters what he says and doesn’t say. It matters if he still has an active Tinder account and what posts and pictures he has on Facebook. Stress will cause you to overreact and over-analysis EVERYTHING. It also becomes the “make or break” point in your relationship. Many women will find themselves either progress into a more committed relationship OR slowly fade out of the man’s life. If you don’t want to lose a great guy, you need to pay attention to your stress level and more important, how to effectively manage it. The actions women do during this “make or break” transitional point will determine what a man does. If you notice a distinct pattern of men disappearing after a few dates, you’ll want to pay attention to this article! Some people are naturally more negative than others. (I like to call them more “realistic”). That’s because people are born with a default negativity and positivity level. Some people are just born to be more one way than the other. I’m actually more “negative” by nature. But I override this daily by making sure I practice “positive thinking” and aim to be happy on a daily basis. Stress can bring out your baseline levels too. For example, when I’m stressed, I will instantly default to negative thinking and negative actions. It can take me a little while longer to get positive again. The reason I bring this up is your negativity is very much in YOUR control. If you want to complain about your job, the weather, your family, your finances or just about ANYTHING – get it out of your system BEFORE you meet up with your man. Men are MUCH more sensitive about negativity than you realize. (Especially in women). The reason for this is due to a man’s natural desire to make and keep a woman happy. Men also know how stressful life can be – they don’t want a woman to ADD to that stress in the long run. Every complaint or negative comment will be taken PERSONALLY by a man. It doesn’t make logical sense. If you asked a guy why they take negativity so personally, they won’t really know either. But they do! And that’s all you need to know. So remember, one negative comment is like ten knife wounds to his chest – dramatic but that’s how you need to think of it. Try to refocus on something about him or external that is positive or neutral. Say LESS and get him to talk more. Sometimes there’s little you can do if you’re in a bad mood. The best you can do is keep the situation as contained as possible. WARNING About Men Drawn to Negative Women! Be wary of men who are drawn to negative women. Yes, there are men who find negative women or troubled women very alluring. Often these men have a “fixer” mindset and want to sweep in and be a woman’s hero. Although this sounds great on the surface – what usually ensues is more frustration down the road. People drawn to “fixer” partners will often find themselves more miserable in the long run (because the fixer will either try to placate your bad behavior – which makes you loath yourself/situation more – OR they will get upset when you don’t change for them). I may write an article about this in the future. You may also be drawn to men who are negative. Once again, if you’re drawn to someone due to wanting to “fix” them you’re in for a world of misery down the road. People can only fix themselves. The sooner you realize this the better your relationships will be. Being controlling is different from being a leader. Alpha females will be those women who prefer to lead the relationship. They’re more vocal about what they want, how they like things and are often very opinionated. That’s fine as long as an alpha female is also considerate of what her MAN thinks. What ISN’T fine is when a woman starts to cast judgment over what he does and how he does it. Don’t get me wrong. Men can also be controlling and critical. What is important is that you’re aware of it happening on BOTH sides. Neither party is in the “right” to be controlling or critical. This kind of behavior only forces the other person to “mute” their true feelings and resort to “passive aggressive” actions. Pull away and withdraw into work, friends or hobbies. More likely to “ghost” her or do the slow-fade. Become emotionally distant and closed off. Keep secrets or hide things from her. The bottom line is, if you want your man to stay close and madly in love with you – restrict or limit your controlling actions. He will naturally want to get close once you start accepting him for who he is. Remember the fundamentals I talked about in Part 1 and Part 2 of this series. Focus on YOURSELF; what you can control, instead of what he is doing. Just because you are in a committed relationship, doesn’t mean you’re now “his other half”. You are still your own individual person. His actions doesn’t and shouldn’t be a reflection of who YOU are. Keep these two ideas separate. Women will resort to being demanding or needy when they’re unhappy, stressed or feel unloved/unwanted by their man. It’s not often a behavior we can “help” because if we’re unhappy – our instinct is to turn to our partner and seek comfort. The problem is managing expectations. Even in the most ideal relationship with the most loving man, a man can only fulfill your needs about 20 – 30% of the time. The rest of the 70-80% is on YOU to take care of. That means, instead of arguing with your partner, you simply leave the area and go do something else. By knowing this ahead of time, you can safely judge whether you’re being reasonable or not. Women will tell me they’re afraid of looking too demanding or needy – so they stay quiet about something they really shouldn’t be quiet about. While other times, women will tell me their man accuses them of being too needy and they constantly need “breaks” to cope. No one is in the wrong here. You’re in the right for speaking up, but your man is also right about feeling pressured. As much as you can – try to solve the need ON YOUR OWN. If you are still bothered by it – it’s time to go to your man and tell him. There is a nice balance you need to strike. This balance will be different for each couple. The important thing is to stay realistic and communicate with your man. Practice back and forth mindful communication. Acknowledge your demanding/needy behaviour and remember what you did when you were single. This is a great time to do some of those “when single” activities. Maybe it’s watching a movie all by yourself, chatting to a girlfriend for a few hours or going shopping by yourself. Sometimes women want a man to CONFIRM his love for her – over and over again. Some women will also give “tests” to a man to make him prove his love to her. Surprisingly, doing this actually PUSHES a man away because it can be emotionally draining. It’s also very very needy. You can teach him. (Some men will put in the effort if they don’t want to lose you. But if it’s his personality, it may not matter how much he tries, he can’t give you what you want). OR you can leave and find a man who is NOT clueless. OR you try to get used to it and love him regardless. Better to leave now than invest years and years into a man who can’t give you what you want. You’ll know if a man is invested or just clueless by how he acts when you pull away from him. If he’s just clueless, he will try to win you back and put effort into the relationship. If he isn’t invested, he will let you slip away. How a man feels about you will be clearly evident in his ACTIONS. If he isn’t doing things to please you and make you happy, he’s probably not worth holding onto. Talk to him about how you feel. Make sure he is aware you’re feeling neglected or insecure. Remember you’re not in a relationship by yourself – if a man cares about you, he will put the effort in to make you feel better (that’s his job). If he doesn’t do this, he may not be the right one for you. Sometimes when we’re confused, insecure or in a bad position in life we don’t make the best choices. Out of instinct, we will push men away on purpose. This could be a defense mechanism OR we’re just genuinely confused. You may find yourself one minute wanting and missing a guy and the next minute feeling suffocated and want to push him away. You’ve been single for too long and not used to being in a relationship. You think he is “too good to be true” and pre-empting something “bad” will happen. Second-guessing your decision to be with him – only to change your mind later. Need the relationship to progress a little slower. All of these are valid reasons. However, if you do push your man away, you can’t expect him to not react negatively to this. Some men are very sensitive to this type of behaviour. If a man suspects you’re going to hurt him, he may pull back to protect himself. If he does do this, the best you can do is be patient and start over. The other thing would be to figure out WHY you’ve pulled away. Are you just lonely and want a man around? Are you scared that things are too good to be true? If you genuinely feel a strong connection with a man, it’s best to take things slow than break up completely. Decide exactly what you want. If you want to keep seeing him, make sure you stay consistent in your level of interest. Even if you feel unsure sometimes – keep seeing him until more feelings develop (or not). You will know in time if it’s just nerves or you genuinely do not feel a strong connection with him. Your man will be viewing you closely to ensure you’re a good match for him. Try to be as easy to be with as possible in the beginning. Be encouraging so he will chase you and keep chasing you. Do not play silly games or he may mistake it to mean you’re not interested. Most of all – have fun, remember all the great values you bring to a relationship and promote yourself in the best light. I know we’re all human and we WILL make mistakes. Women can push men away in all kinds of ways. But remember as long as you’re AWARE you’re doing it, you can undo it. Being aware of our needy and controlling behavior is another way to keep track of our “stress” level. When we’re stressed, it tends to bring out the worst in us. Managing that stress effectively is often the difference between having an effortless relationship or a drama-filled relationship. It also shows him that you have self-control and can adjust to changing circumstances. We’ve reached the end of “The Secret to Make Him Chase You” series! I’ve had a lot of fun putting this together. It’s important to remember why we do what we do, and why men do what they do in order create more successful relationships. If you would like a more in-depth, step-by-step guide on how to find, attract and keep quality men (yes they exist) and get them eager to commit to you, be sure to check out my program, Irresistible Dating Method. Within I cover the 7 frameworks that will take you from dating to an engagement/marriage in less than 12 months. Click here to find out more. You can also check out my free tools and resources on dating & relationships when you subscribe to my email list. I’ll keep you updated on the most powerful tips and tricks on how to GET that dream guy you’ve always wanted.